Your teeth are connected to your jawbone by a root that anchors it into place. When your tooth is extracted or lost and unable to repair, the root structure is also removed. Dental implants serve the same purpose as the root and connect your tooth to the jawbone. At our practice in the Monrovia area, we create and place the restorations that attach to the dental implants to get as close as possible to the function and appearance of your natural teeth. Used for a single implant: When a tooth is knocked out or an infected tooth is removed, patients can replace just one tooth with a dental implant and crown. Multiple teeth: If more than one tooth is missing, patients have the option to place two or more teeth on one dental implant. Set: All teeth can be replaced using less dental implants. Some cases will only require four to six implants to stabilize teeth. Create temporary restorations that match your natural teeth. Refer our patients to a trusted specialist to place implants. Attach temporary teeth to dental implants. Switch out temporary restorations for permanent ones. The entire procedure usually takes four to six months because your dental implant will need to attach to the bone and heal completely before the permanent restorations can be placed. Mimicking the structure of natural teeth. Your dental implant and crown are a way to restore your root and natural crown. Inflicting less damage to surrounding teeth. For some patients, a dental bridge is not the right solution because of the constant wear and tear of their teeth. Depending on your dental anatomy, you may need dental implants as a stronger alternative to a dental bridge. Being easy to maintain. Dental implants give you the freedom to eat, brush, and floss normally. You won’t need to change a thing about your dental hygiene. Having a natural appearance. We fabricate crowns that are indistinguishable from your natural teeth, matching the shade and shape of your crown to natural teeth. During your initial consultation, Dr. Q will perform digital imaging and an oral exam to formulate a plan to restore the aesthetics and function of your natural teeth. How Do You Create Restorations for My Dental Implants? The process of creating your restorations is the same as for a crown. Dr. Q will take an impression of your tooth or teeth to fit into the space left by your missing tooth. The impression for your crown will be taken during your initial visit and only takes five to ten minutes to get an exact replica of your natural tooth. It will take a few weeks to fabricate a crown, but in the meantime you will have a temporary crown placed onto the abutment of your dental implant. Once the permanent crown is ready, you’ll come in to switch out the temporary one. What Is My Crown Made of? Our practice avoids any using anything but noble metal (gold) to secure crowns. Dental implants are usually made of zirconia, which is a strong material proven to be very effective in fabricating a crown that blends with the size, and shade of your natural teeth. Our dental practice in the Monrovia area offers general procedures such as fillings and crowns as well as more complex treatments such as root canal and oral surgery. We have trusted partnerships with other dental professionals if you need any procedure that we do not perform at our office. Our entire staff is engaged in the community, volunteering with several non-profits to contribute back to the community. 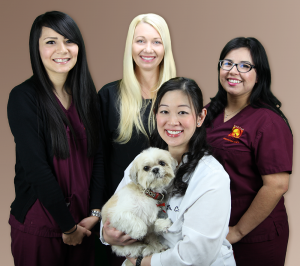 Dr. Q and her entire staff are dedicated to not only providing beautiful and healthy smiles for her Monrovia patients, but also creating a much better community in which to live. Have a question about dental implants? Ready to schedule your initial appointment? Contact our office in the Monrovia area at (626) 599-9819!